Become a part of the OneStone Family! Solves a problem.. allows their patrons to charge their phones! Allows venues to make more money via advertising their offers and keeping their customers happy. Advertise their promotions, events, services and products without printing costs! This Saves them money and promotes their offers BETTER! This is a WIN/WIN/WIN product for venues, customers and advertisers alike! 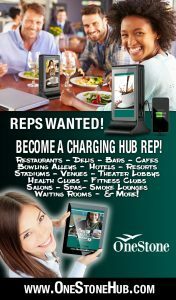 Earn residual income while offering awesome solutions to local restaurants, coffee houses, bars, hotels, & entertainment venues. So, Join the OneStone Family an represent our product while making residual commissions and awesome relationships.